Vatika Group is one of the leading real estate developers in India. We believe in creating value that lasts. Our residential projects are imbued with our belief that help us stand apart from our contemporaries. We have excelled in developing real estates that are built, keeping in mind all the comfort and ease, you and your family desires. Vatika’s Infotech City is the epitome of the innovation and the creativity that we have garnered, over decades of endeavours, that will last for an eternity. The residential premises are beautifully landscaped, with homes amidst gardens and trees, surrounded by the beauty of nature. The individual residential projects are planned so as to provide all your basic amenities at convenient distances. The interiors of every home is designed by skillful and experienced architects, with creativity that transcends traditional living experience. Vatika Infotech City is situated in the beautiful city of Jaipur. The township has been developed in a lavish 600 acres of land, amidst the picturesque beauty of nature. It comprises of several independent residential projects that are built to serve individual needs, from high-rise apartments to independent plots. 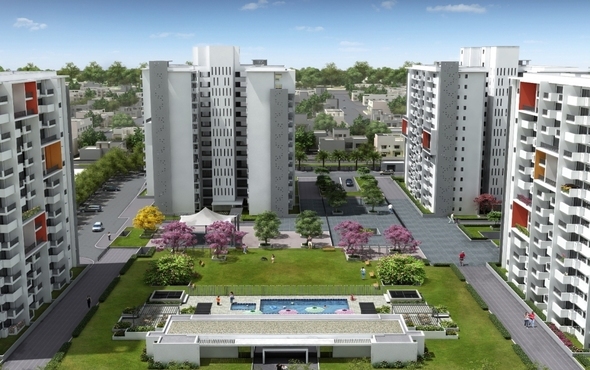 Jaipur 21 is one of the 5 residential projects that Infotech City has to offer. With soaring towers and stunning panoramic views, Jaipur 21 is a breathtaking residential project in Vatika Infotech City, Jaipur. The project has been designed by Singapore’s renowned design house, Warner Wong, in association with Spazzio. The architecture is futuristic, but with an unmistakable touch of Jaipur. Spread over a total area of 8.5 acres, Jaipur 21 offers all the basic and modern amenities that one could desire. Some of the facilities and amenities include retail spaces, a function/community room, wading and swimming pool, child-care facilities, a sports club, tennis courts, just to name a few. Vehicles are restricted to the peripheral road going around the 14-storey high towers, leaving the rest of the area for landscaped greens and community areas. Jaipur 21 has 416 beautifully designed apartments spread over 1.0 million sq. ft. of space that offers the most modern luxuries. The artistically rendered exteriors of the towers complements the striking design and interiors of the apartments. The design emphasizes on creating an open environment within the apartment, and the splendid view of the whole township from these high-rises is truly euphoric. Jaipur 21 has two to four bedrooms flats with floor area ranging from 1250 to 3650 sq.fts. A number of duplex apartments are also available. A classic fusion of its state-of-the-art architecture and the contemporary international lifestyle, Jaipur 21 offers a rich blend of attractions to its residents. The Westin, a five star hotel from the international Starwood chain, is coming up on the city’s main boulevard. Nearly 50% of the total area has been reserved for parks, other green areas, roads and community facilities. The roads are exceptionally wide, and all the streets have sidewalks to encourage walking. The entire city has been planned along eco-friendly lines. Water harvesting is an integral part of the infrastructure, and so is the recycling of water for irrigation etc. Vatika Infotech City also has its own sewage treatment plant. All electricity cables run under the ground, leaving the surroundings uncluttered. Moreover, there will be a shopping and entertainment mall as well as a fully-equipped hospital. A total area of approximately 7 acres* evenly distributed across the entire site, has been earmarked for local shopping centers. 28 acres* of land have been set apart for primary and nursery schools, religious places, police posts, fire stations and dispensaries. This entry was posted in Township Jaipur and tagged apartments in homes, residential properties, residential societies in Jaipur on November 8, 2013 by Admin.